The chipotle aioli (an easy blitz of chipotle peppers in adobo sauce with lime and mayo in a blender) is what makes these tacos stand out—and you can save the leftover sauce for a zippy sandwich spread. Going DIY is cheaper than delivery by a mile. But the key to keeping this low-cost is to skip the gourmet toppings (burrata, imported salami) and stick to just a few veggies. Pancakes scream “budget,” but for some reason veggie-studded fritters feel almost decadent. And you can adapt this recipe to accommodate almost any extra veggies you have on hand. Serve them with a giant, simple salad, and dinner is done. Bone-in chicken thighs are a thrifty cook’s best friend, and this sumptuous dish is one-pot to boot. We make dead-simple roast potatoes for the side, and guests leave happily stuffed. Chef Aarti Sequeira relied on mujadara to stretch her husband’s unemployment check during the couple’s lean days. In this Lebanese dish, caramelized onions transform lentils and rice into something that feels posh. The main ingredients are so cheap, you can even spring for a sprinkle of pine nuts. You don’t need much meat to flavor an entire pot of pasta (a half-pound of well-seasoned sausage can do the trick for a party of four). But it’s the addition of cannellini beans or chickpeas that sets this dish apart. Eggs are cheap, but for some reason my friends haven’t warmed to the idea of a scrambled egg party. Frittata, on the other hand, is a consistent dinner-time crowd pleaser, especially when it’s studded with tender potatoes. Madison’s recipes manage to coax so much flavor out of even a short and simple ingredient list, and this soup is no exception. Bonus: It actually tastes better if you make it ahead of time, then reheat just before the guests arrive. Risotto is too fussy for some, but if you don’t mind stirring at the stove you can wow guests with a luxe, velvety bowl of basically rice, peas, and a bit of bacon. 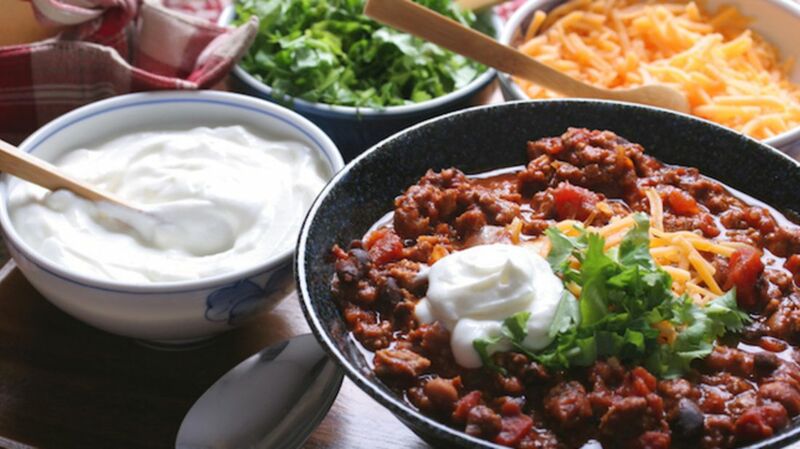 You provide the giant pot of chili and ask your friends to potluck the toppings—because fixings like sour cream and shredded cheese and diced tomatoes really do add up!